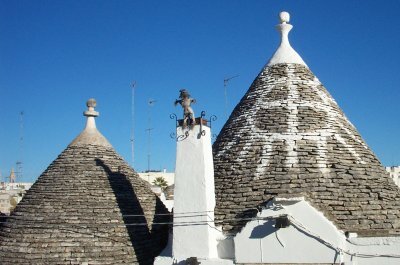 The trulli of Alberobello are an exceptional example of a building technique that has survived from prehistoric times until to date. The site consists of the Monti and Aja Piccola quarters of Alberobello, and some individual buildings elsewhere in the town. Trulli are built without using mortar: the stones are laid on top of each other. They are also characterized by their dome-shaped roofs. These roofs are in some cases painted with a magical or pagan symbol. There are many stories about the origins of this construction style. In the Middle East, burial tombs were already built in the same manner thousands of years ago. Also it is said that this way of building makes it easier to quickly dissemble the house and relocate, or that in this manner taxes could be evaded. They are everywhere in Alberobello, the Trulli. 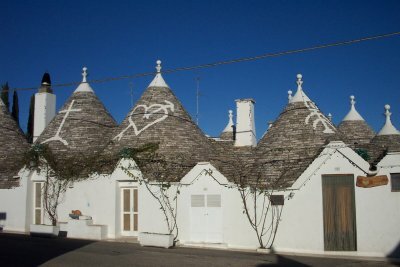 The Trulli-phenomenon could be considered as one big tourist trap, by which the livelihoods of a whole town are supported. But I found them too picturesque and too much fun for that. The Aja Piccola area is less commercialized than the Monti, and therefore generates a more authentic feeling. You can spend a few hours roaming around both quarters. Only more time is needed when you want to make a study out of the small differences between all Trulli (don't bother, someone has done that already and came up with 5 categories). 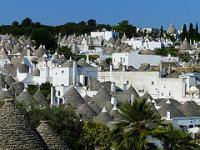 There are some exceptional Trulli in Alberobello. 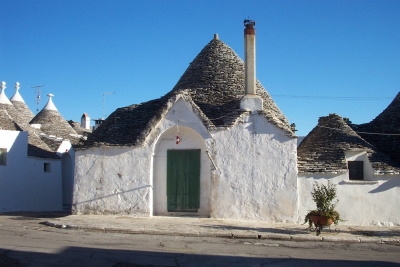 For example the two-storeyed Trullo Sovrano. It's quite spacious inside: it has several rooms downstairs, a garden and a second floor to house guests. Another, with more subtle differences compared to the normal ones, is the Trullo Siamese. Siamese twins are said to have lived here, or maybe it's just two Trulli under one roof. I visited this WHS in June 2014. I spent 3 splendid days living in a trullo in Aja Piccola, which is the residential quarter where most locals live. It's like stepping back in time with several old cars from the 60s and 70s parked outside the trulli. I visited the commercial quarter, Rione Monti, early in the morning and late in the afternoon/evening when all the tourist groups were gone or hadn't yet arrived. I visited many trulli to see the different interior designs and I must say that the ones in Aja Piccola are definitely not to be missed. 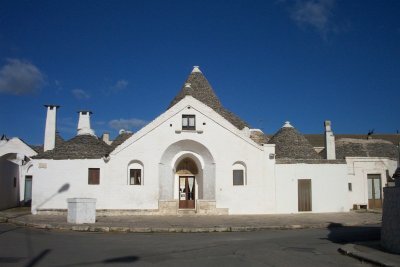 The Trullo Sovrano and Casa Lippoli have been converted to museums but both are worth a visit. The Trullo Siamese is more interesting from the outside than the inside and the same applies to the quaint church in Rione Monti. The views overlooking the 1000+ trulli from here are worthwhile but the best views are from the Belvedere near Piazza del Popolo or the public gardens nearby. Unless you spend at least a night in a trullo in Alberobello wandering from one trullo to the next, gazing at the different pinnacles and white painted signs (Christian, Jewish or Pagan) on the trulli, to experience "slow tourism" at its best ... you will miss out and you will end up looking at Alberobello as a tourist trap without realising all this surreal WHS needs to reveal its OUV is TIME! The first time I went to alberobello was in 1975 & was fascinated by this place! Always wanted to visit it again & finally after 37 years I went together with my husband; we stayed in a trullo, such a lovely experience! Will certainly not wait another 37 years to visit this amazing place! Apulia in general is not very touristy, at least compared to other Italian regions such as Tuscany or Campania, but Alberobello is. The place is the highlight of any trip to this region at the heel of the Italian boot, and it's easy to see why: a nice little town, quaint and very unusual houses and lots of souvenir shops. To avoid those, it is only necessary to wander off into the side streets, where you can find exactly the same kind of trulli. The quarter of Aja Piccola is less touristy than the Monti area. The trulli are not confined to this town, but are rather spread out over a large area, and can be seen far out in the countryside. The houses themselves look pretty similar, but you should take note of the different symbols painted on the roofs (mostly Christian, but also some pagan signs). The Trulli of Alberobello are absolutely amazing! It was such a beautiful sight after being kept on a bus all day. The narrow streets and the atmosphere created by the locals makes this small town feel like home. If you are ever in Puglia and have a few hours to spare make sure you go to this lovely town. I made Alberobello an afternoon stop in my journey from Bari to Lecce in March 2005 and was well rewarded for doing so. The trulli are truly exceptional, but I also recommend Alberobello as a pleasant town for its Pugliese charm and general ambience (at least on a sunny March Saturday). On your way into or out of the town, don't miss the views from the train or car of the surrounding countryside to see the trulli in their natural setting. One way train ticket from Bari costs 3.60 euros; from Lecce 6.20 euros, as of March 2005. 153 Community Members have visited.